When we sit up tall, we can feel our belly muscles helping hold us up. Pay attention as you try this pose. Sit up tall and make your belly very strong. As you twist, move slowly and gently. Find the place where you feel strong and a little bit challenged. Then take a few breaths and feel your strength holding you. You are so strong! 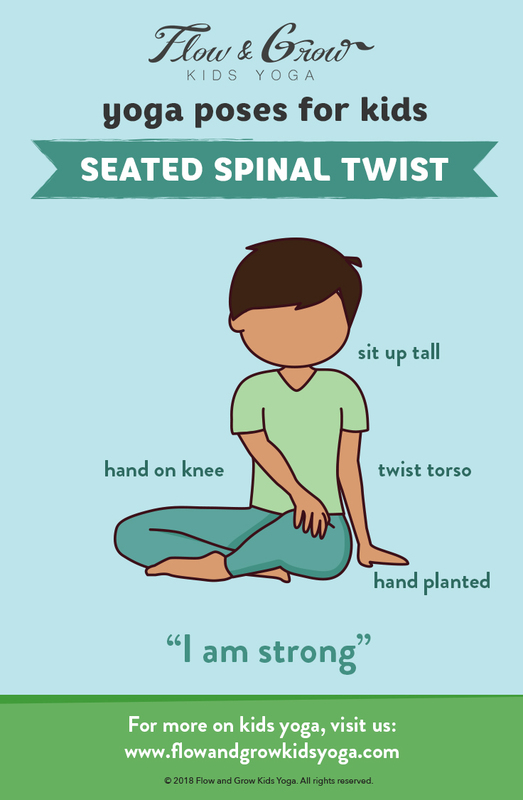 Sit up tall in crisscross applesauce. Make your belly strong. Place one hand on your opposite knee and the other hand behind you. Press into your hands and use your belly strength to continue to sit up tall as you twist. When you’re ready to gently release, come back to center. Then repeat on the other side. To celebrate Autumn, we can modify this pose with a fun exercise - let’s go Apple Picking! Autumn is the season for everything apples and pumpkins, let’s pretend to go on an apple picking adventure. Start by sitting in criss cross applesauce. Now, imagine you are apple picking. Extend the right arm up and pretend to pick some delicious apples. Then, bring your right hand to your left knee, twisting your torso. Encourage your little ones to develop lifelong, healthy habits with some of our favorite seasonal items!